2. Sponsored Candidates are also eligible to apply. No stipend for in-service Candidatesand also to sponsored Candidates. No stipend for in-service Candidates and also to sponsored Candidates. Conventional Electrophysiology study and interpretation of Intra-cardiac ECGs. Hands on training in Electrophysiology study & RF ablation of common arrhythmias. 3D Mapping & RF ablation of complex arrhythmias, theory and practice. Attending courses conducted on Electrophysiology in other institutions. Clinical research work related to Electrophysiology study and devices. a) Basic Sciences-structure & function of Heart and foetal circulation. b) Must learn to examine, investigate and diagnose all the Congenital Heart diseases including rare and complex congenital. Must learn to do the Echo Cardiography interpret accurately and report methodically. c) Desirable to learn to do the foetal Echo, Transoesophageal Echo & Pre-operative Echo and Interpret. 200 Cases of Echo along the Echo Technicians or Cardiologist. 150 cases of both simple and complex cases. A log book to be maintained about the cases in brief the clinical findings and in detail about the Echo features and diagnosis to be corrected at regular intervals. The candidate will be posted to work for 3 months in Paediatric Cardiology OPD and Wards initially to get familarise and accompany the patient to observe the Echo and interventions in the Cath Lab. Posted to Echo room for 6 months, Posted to Paediatric Cardiology Ward and PICU to learn the management of cyanotic spell and other emergencies for the final 2 months and 1 month in post Operative Paediatric Cardiac Surgery ward. Anatomy & Physiology of Cardiovascular System, coronary circulation, IHD, & Anaesthetic Management. Pharmacology of IV, Inhalation agents Pharmacology of antiarrythmia, antifailure & antianginal drugs. Pre-operative assessment and Evaluation of Cardiac patients, intra-operative monitoring, Blood transfusion conservation of Blood coagulation monitoring. Pathophysiology of CHD & Anaesthetic management of Paediatric Cardiac Surgery. Pathphysiology of RHD & Anaesthetic management. Operative care, ventilatory care, psychiatric care. Infections, AIDS, anti-biotics & Nutritions. Cardiac Catheterisation, pacing and other procedures. Echocardiography, TEE studies, MRI etc. Heart failure, transplantation, ethical & legal aspects. One publication or two representations at State/National level. Organisation & Management of Critical Care Units. MONITORING-Cerebral Oxygenation, Cardiac Output & Management of arrhythmias. Infection in ICU-Prevention & Treatment strategies antibiotics etc. Sepsis leptospirossis, Pt, Aids & other special situations like MOF etc. Neuro critical care, SAH etc. Syllabus : As per Rajiv Gandhi University of Health Sciences, Karnataka. 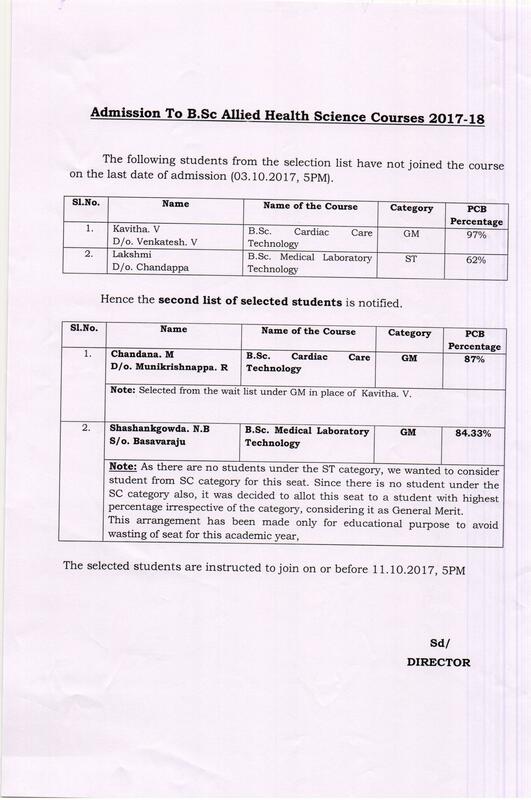 Eligibility : Pass in PUC examination or an equivalent examination recognized by Rajiv Gandhi University of Health Sciences, Karnataka. Stipend : Rs.4000/- per month during Internship Period. Eligibility : PC B.Sc (Nursing)/B.Sc (Nursing)/ GNM, with one year experience as a Staff Nurse.